I found this recipe in an issue of Cuisine at Home. I have modified it a bit, but my oh my. 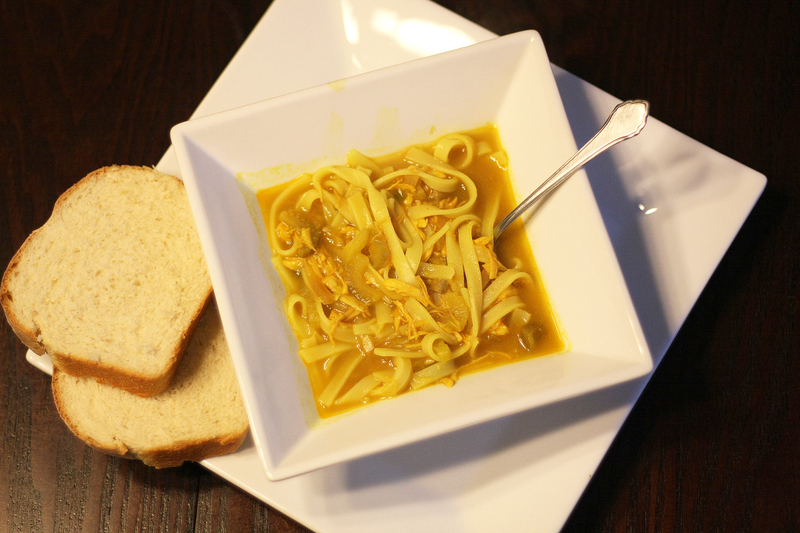 If you love curry, this soup is for you! I also tried out my new KitchenAid Mixer and dough handle, making some fresh bread to dip into this soup for dinner tonight. Great comfort food for a cold winter night. Enjoy! Sweat onion, pepper, celery, mushrooms, curry, ginger, jalapeno, garlic and oil in a large pot over medium-low heat until onion begins to soften. Stir in broth and chicken. Bring soup to a boil over high heat. Reduce heat to low and let simmer for 1-2 hours. About 30 minutes before serving, turn heat back to boiling and add noodles. Cook until done. Return heat to low until ready to serve. Season with salt, pepper and a squirt of lime juice. Sprinkle sliced scallions on top if desired. Enjoy!